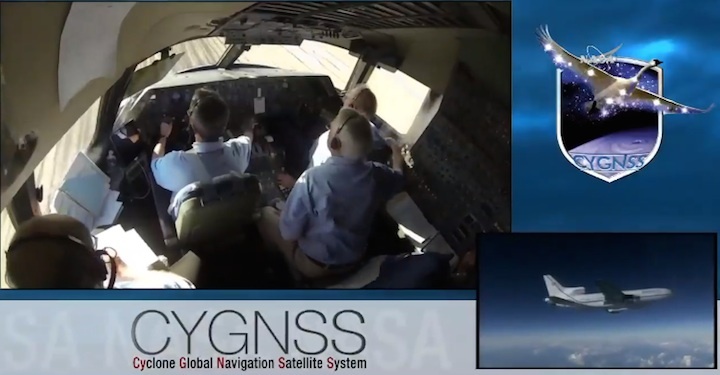 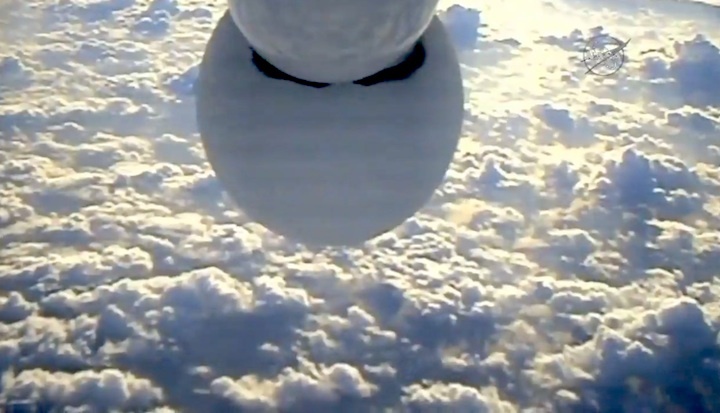 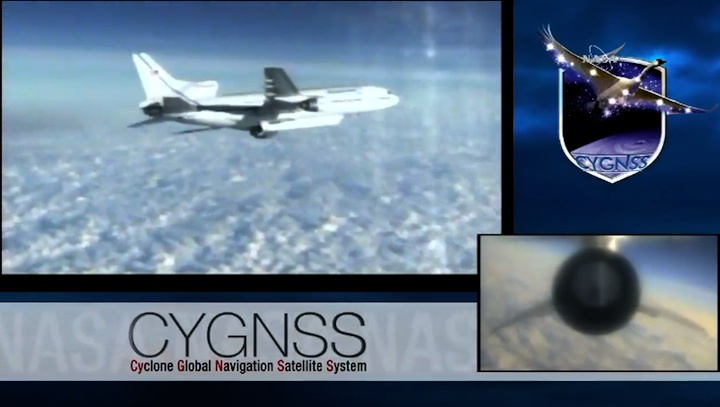 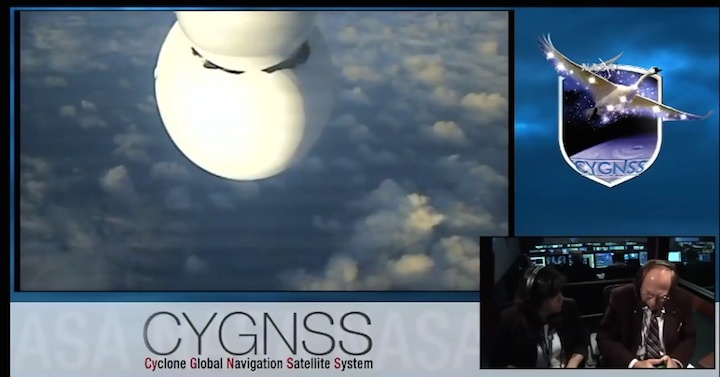 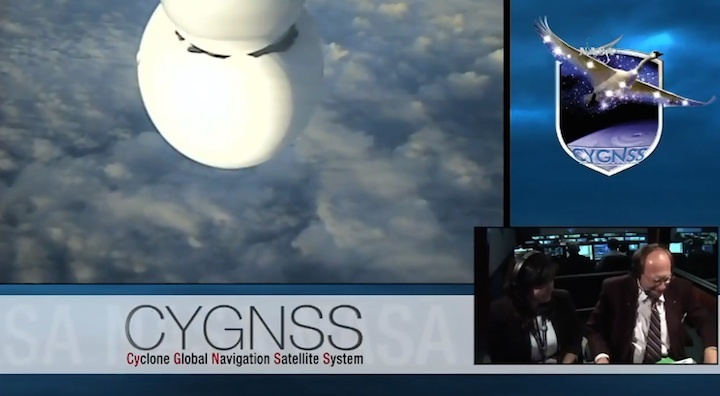 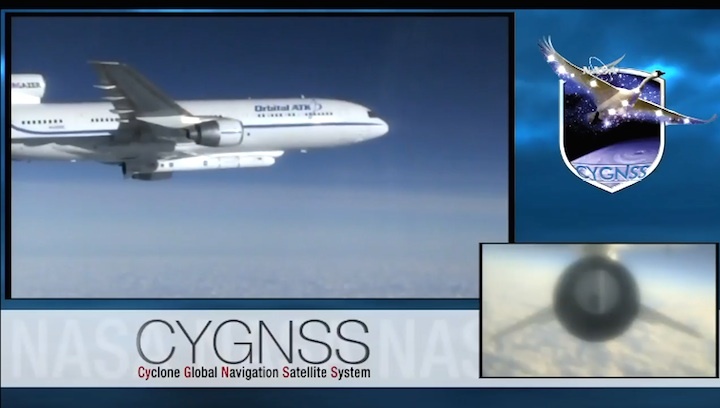 NASA's eight CYGNSS satellites are now in orbit and ready to forecast some of the most violent storms that can rage on our planet. 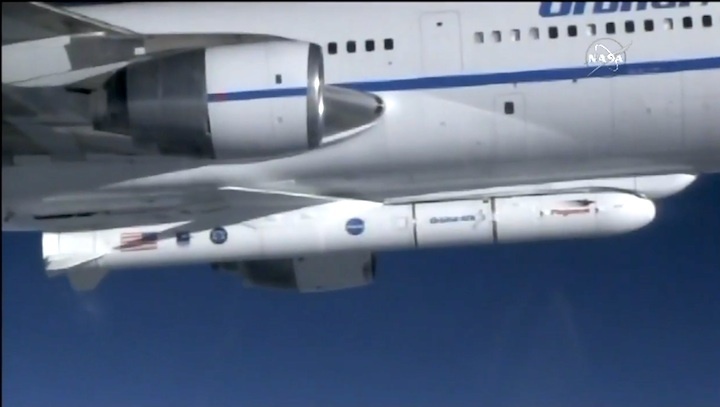 NASA has just launched a group of small satellites that will be used to track extreme weather events down here on Earth. 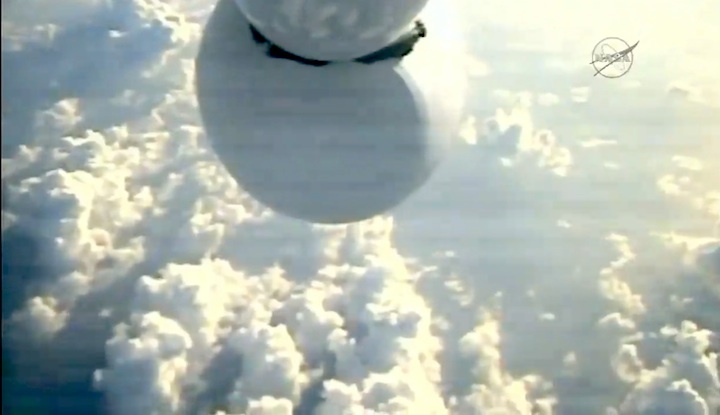 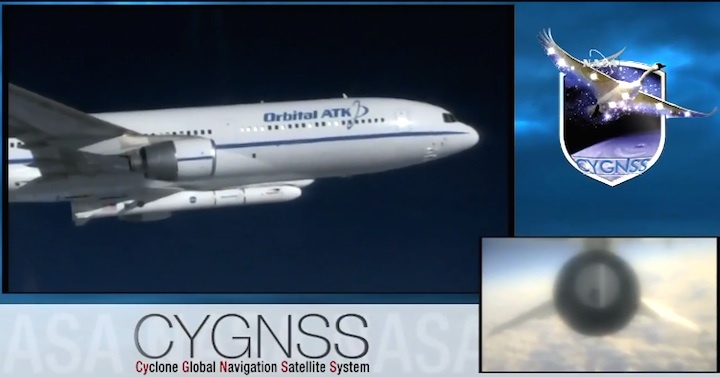 But this launch wasn't your regular launch pad lift-off; the eight Cyclone Global Navigation Satellite System (CYGNSS) sats were blasted into space by a rocket dropped from a jet high in the stratosphere. 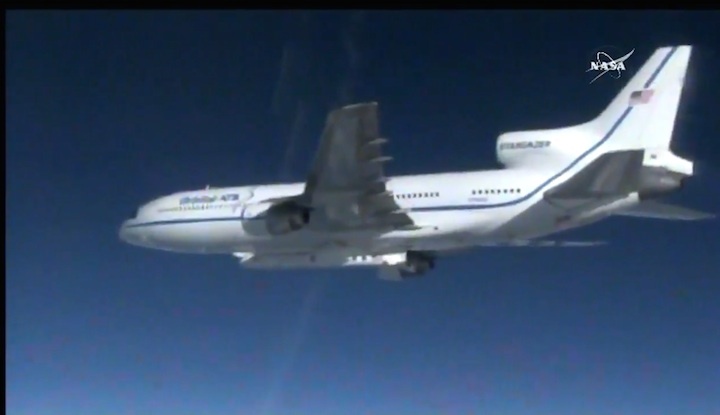 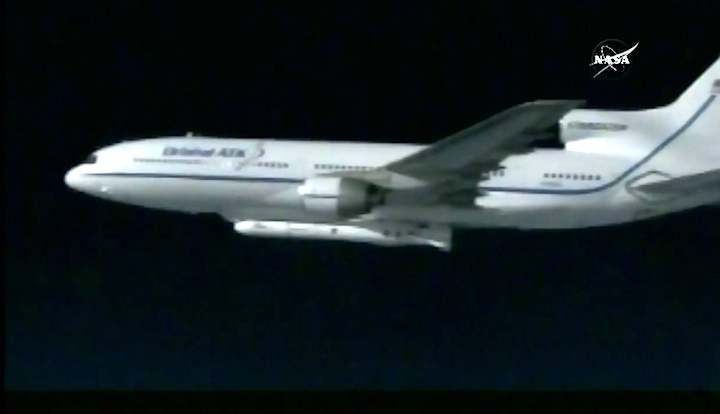 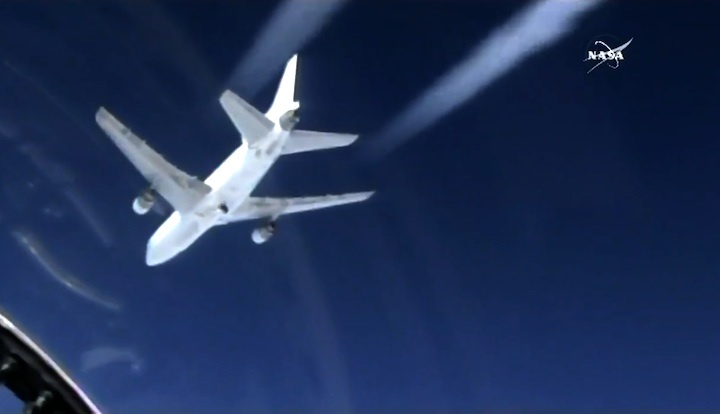 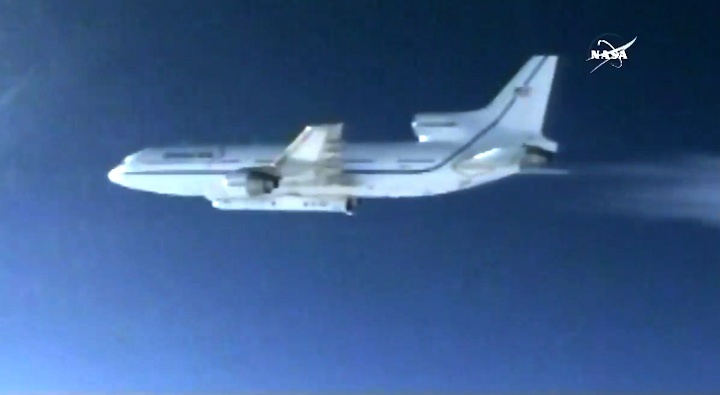 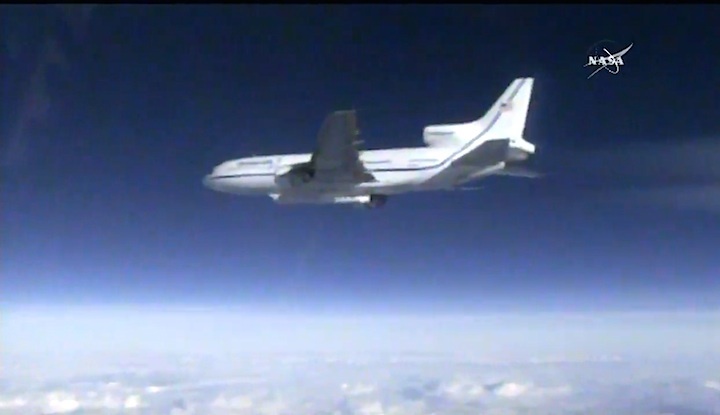 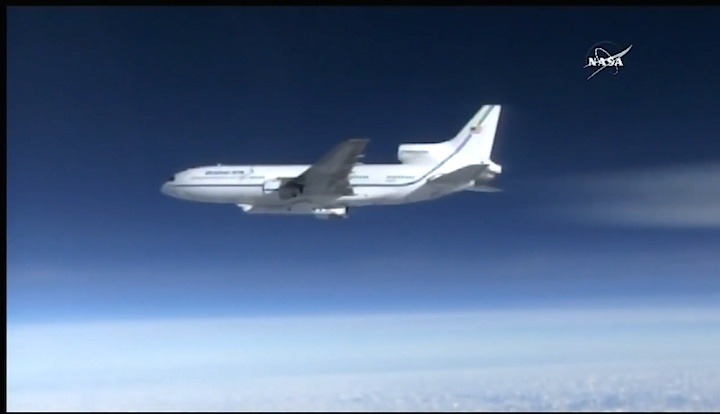 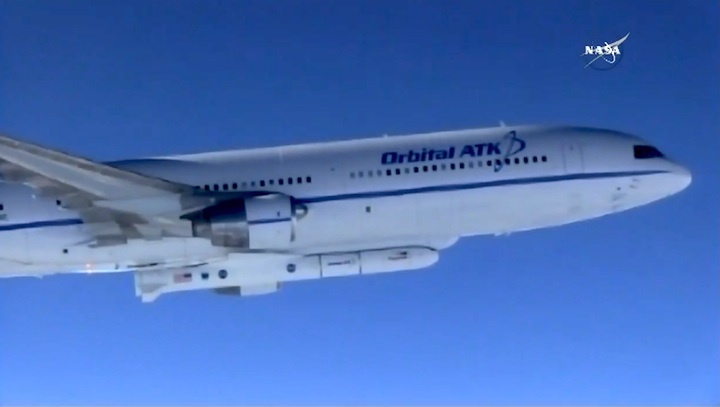 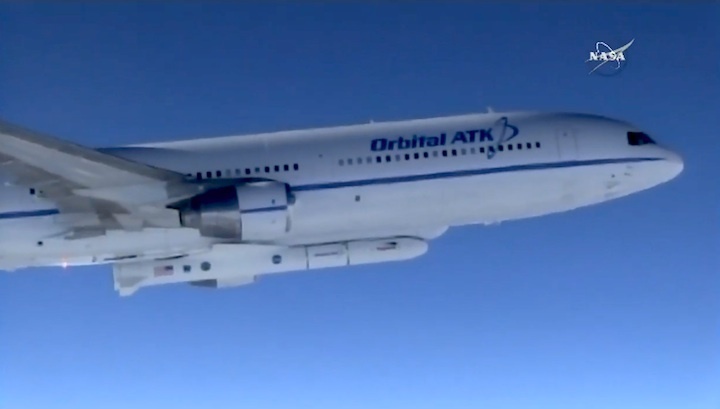 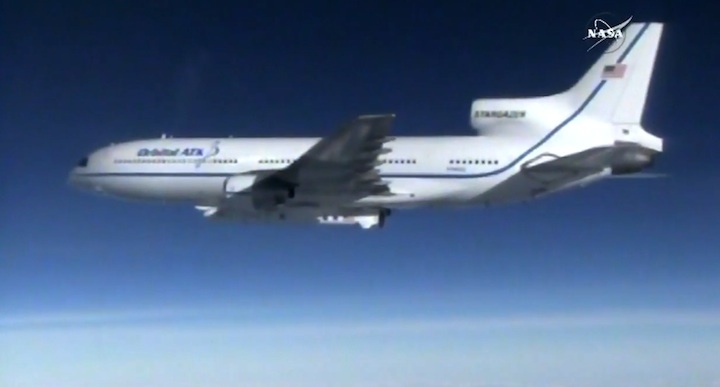 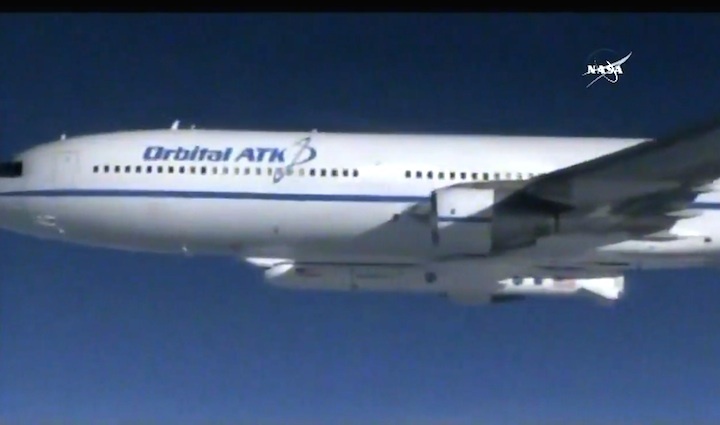 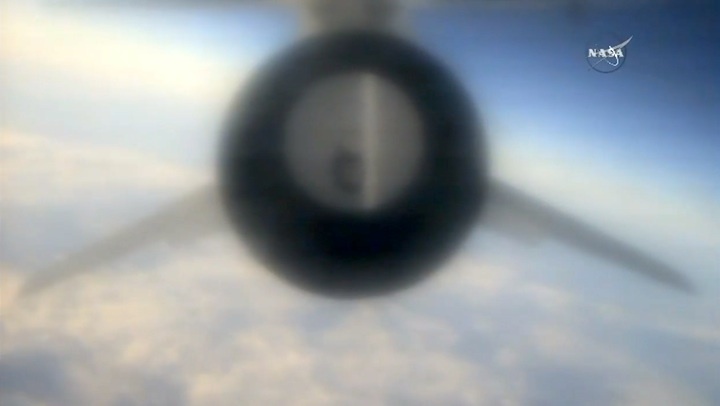 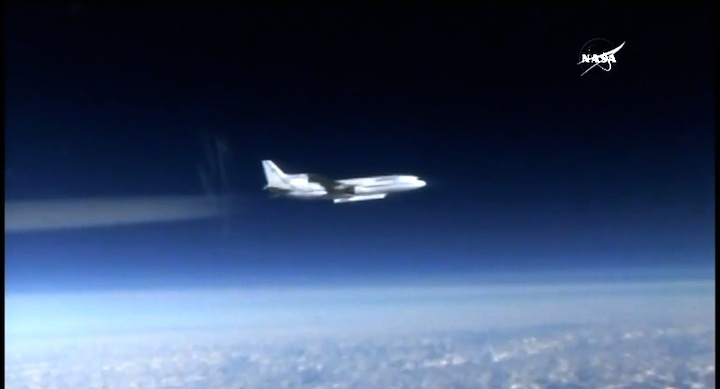 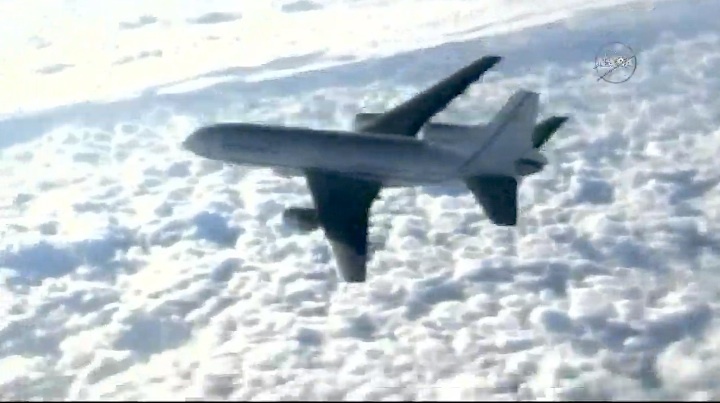 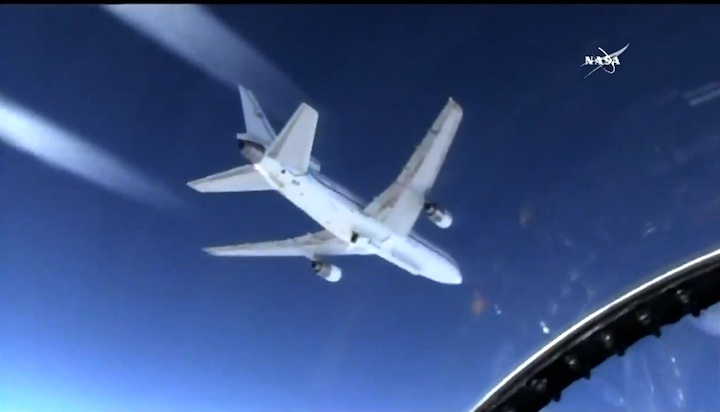 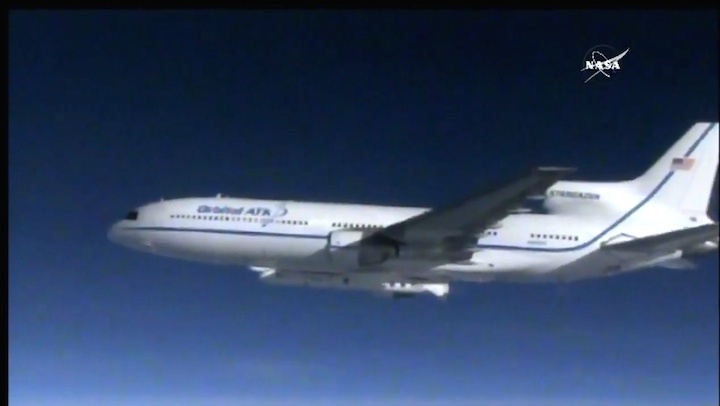 When carried on the belly of the Orbital ATK Stargazer aircraft (a converted Lockheed L-1011 TriStar jet that was built in 1974), the Pegasus XL has one of the most dramatic launch profiles when viewed from the accompanying chase plane (pictured above). 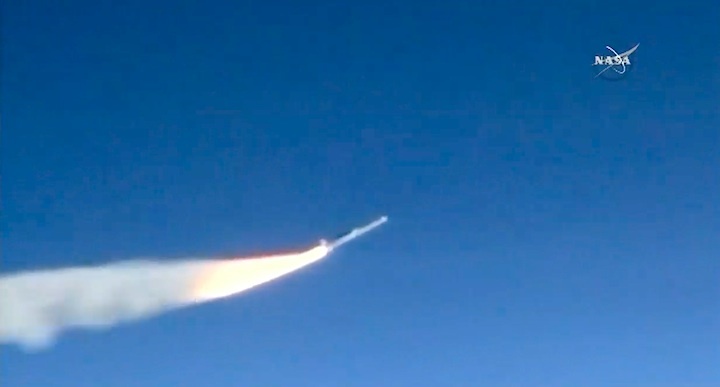 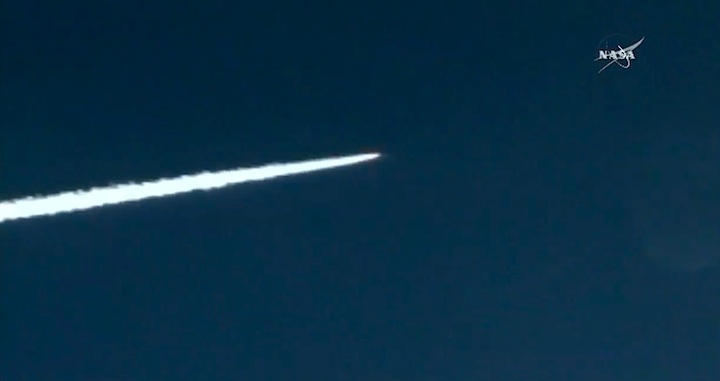 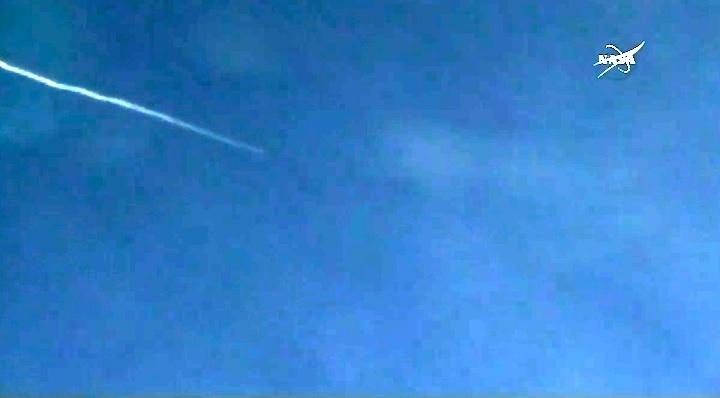 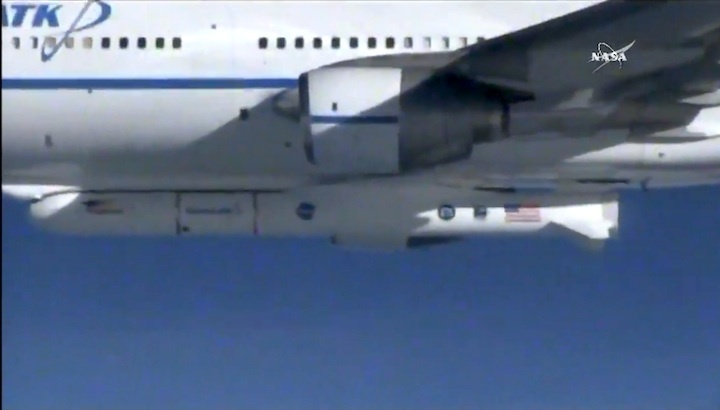 When released from the jet at an altitude of around 40,000 feet, the rocket, which resembles a cruise missile, is stabilized by small fins and a tail. 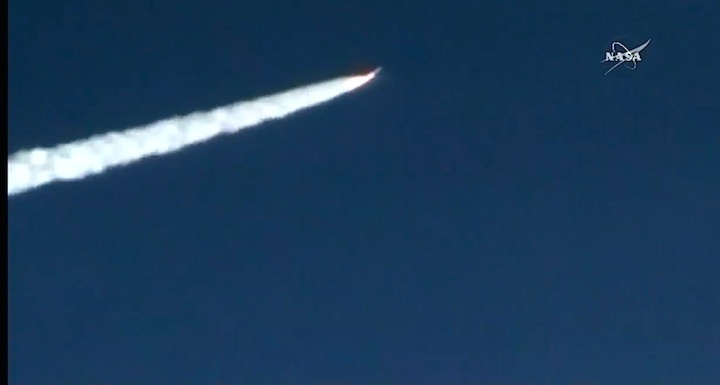 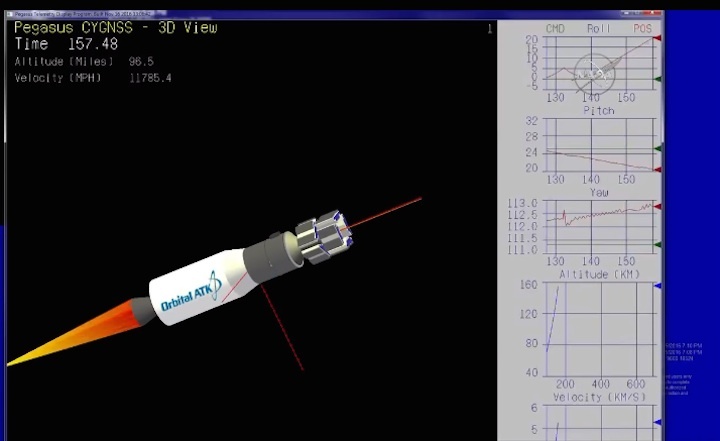 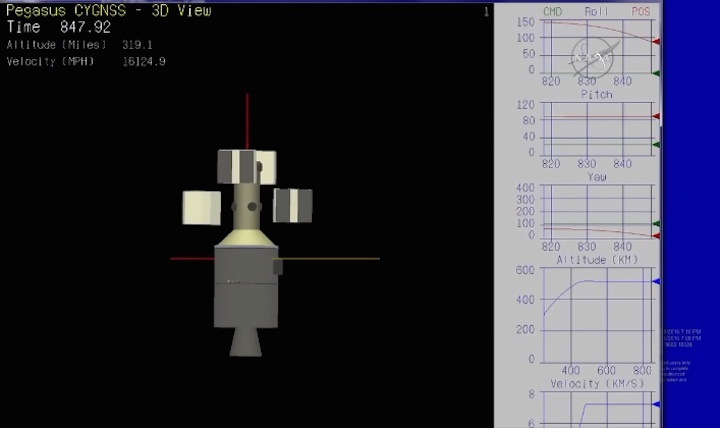 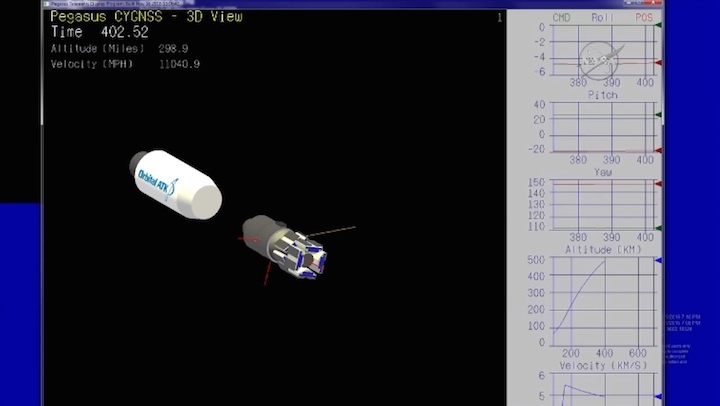 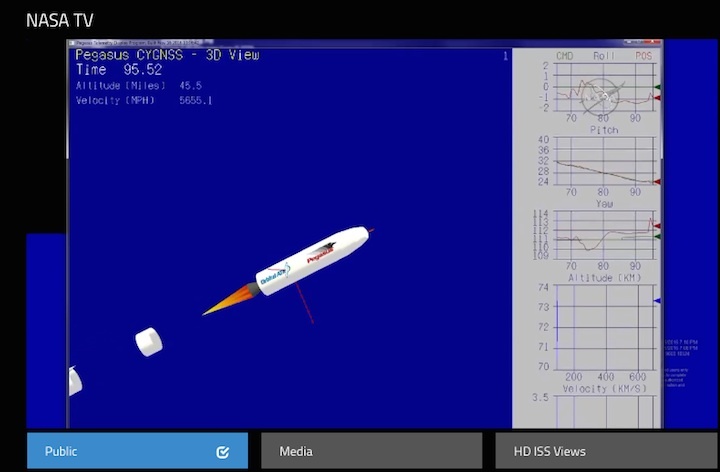 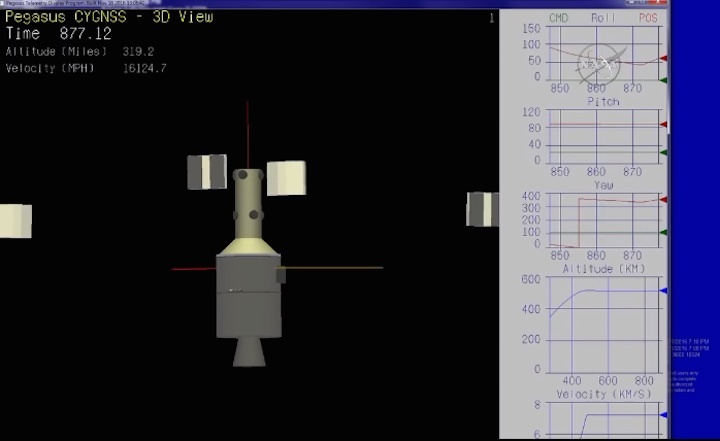 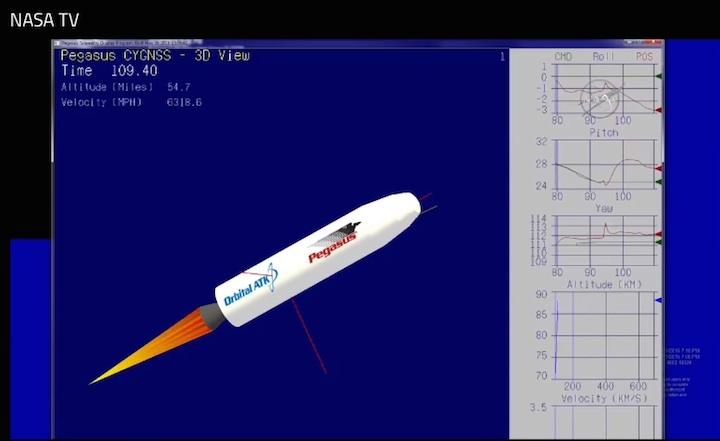 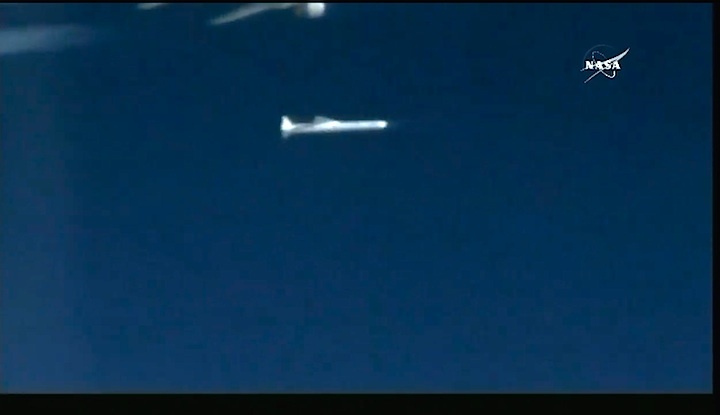 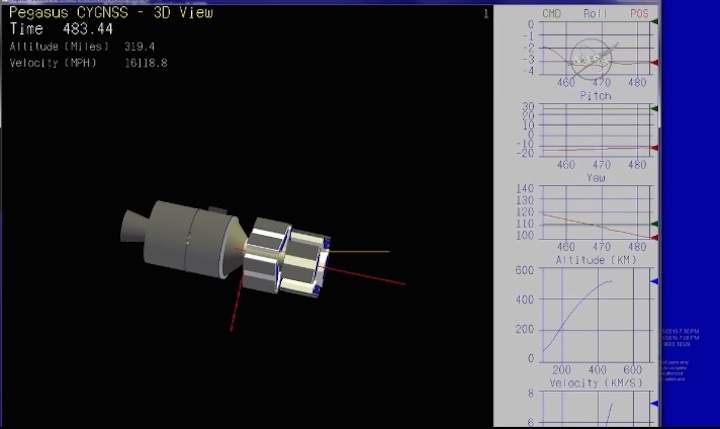 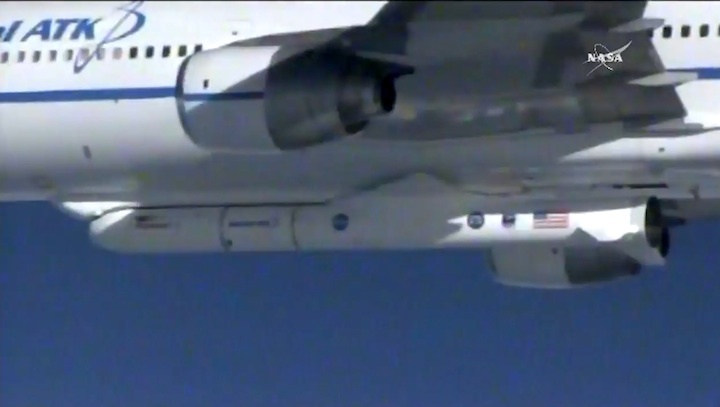 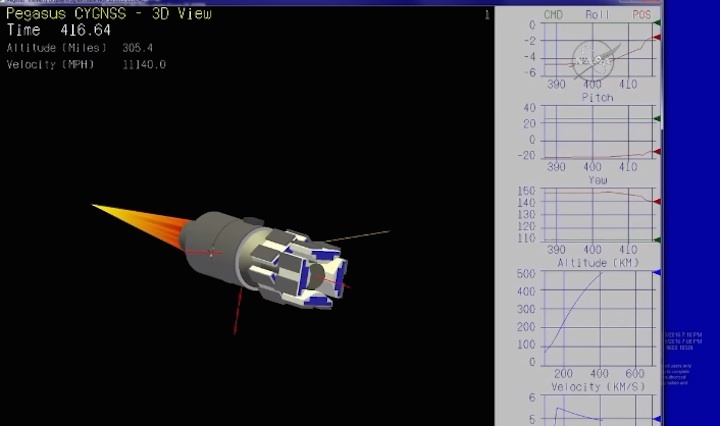 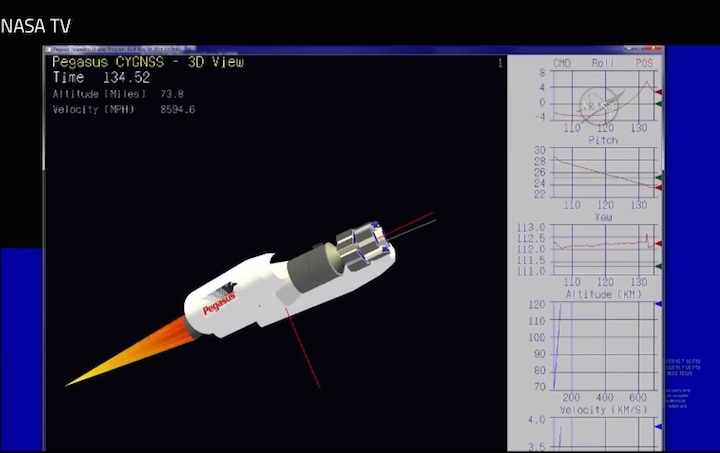 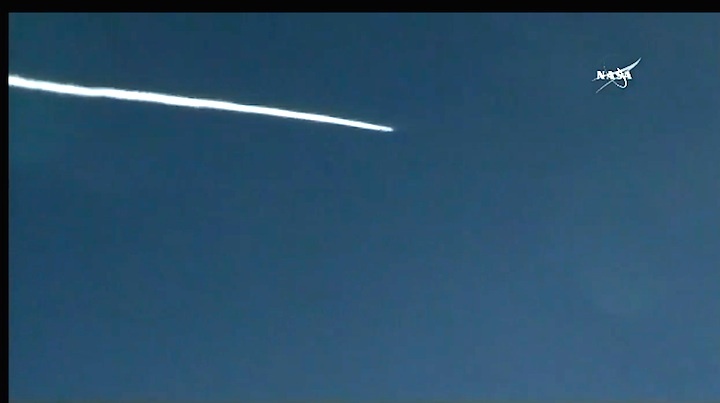 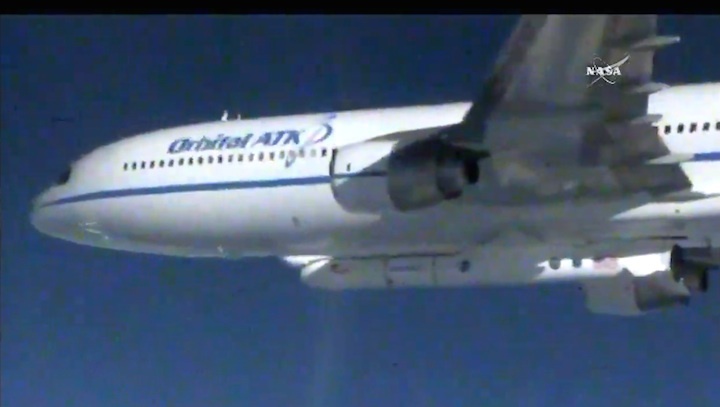 When its rocket engine lights up, it glides ahead of the aircraft and then gradually climbs, quickly gaining altitude. 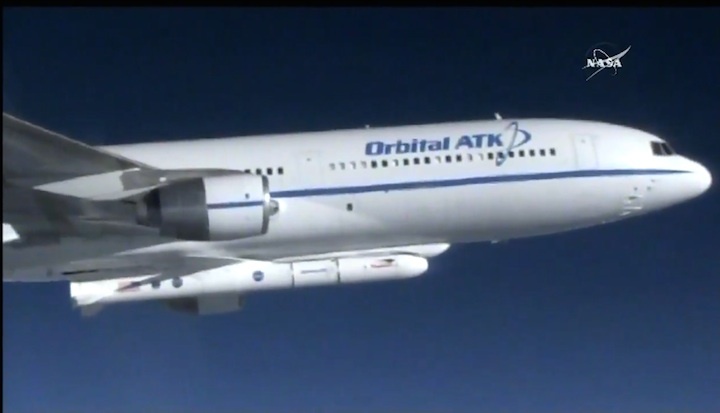 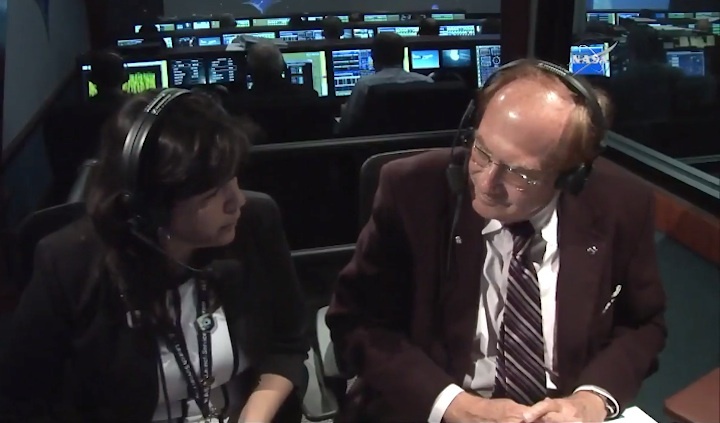 This kind of launch allows NASA and other agencies to launch groups of small satellites without having to depend on often expensive multi-stage rockets launched from the ground. 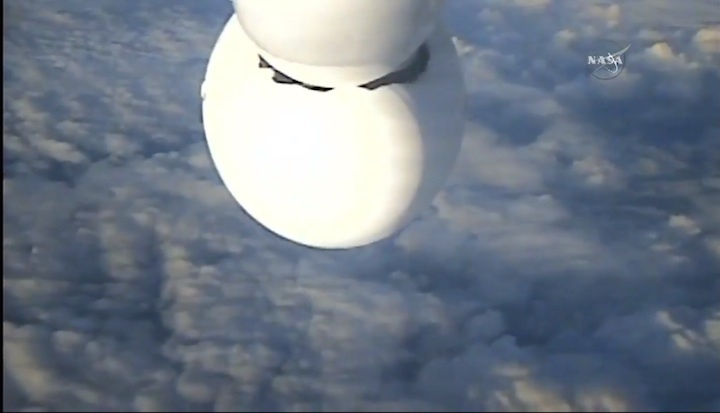 Two previous launch attempts on Monday and Wednesday had to be scrubbed, but this morning's launch was carried out without a hitch. 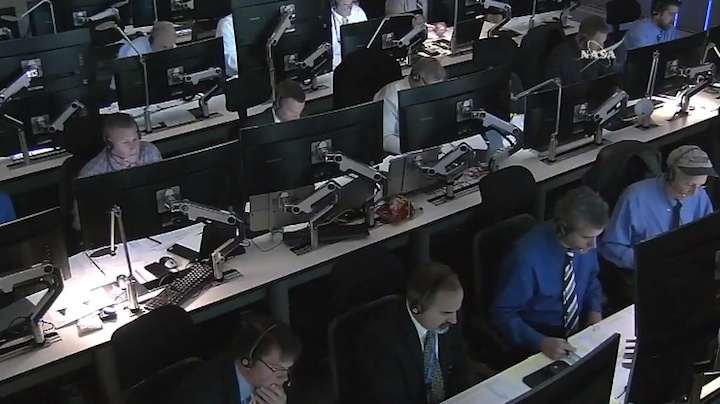 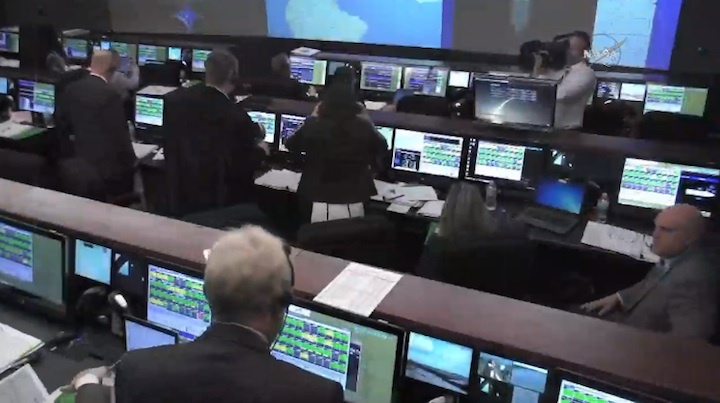 According to NASA, all eight satellites have been placed into orbit and, at time of writing, five have already communicated with mission control and the remaining three are expected to check-in soon. 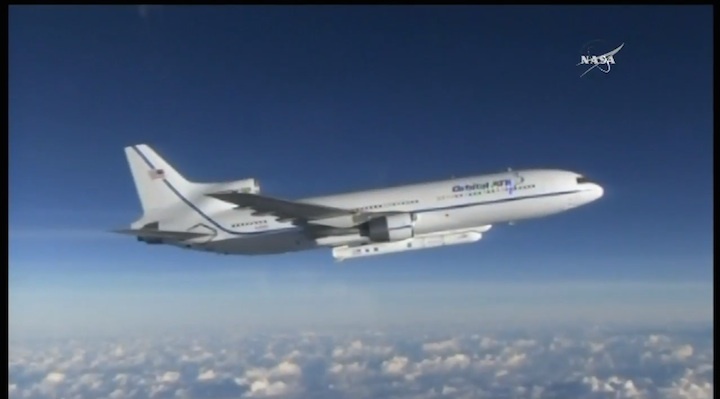 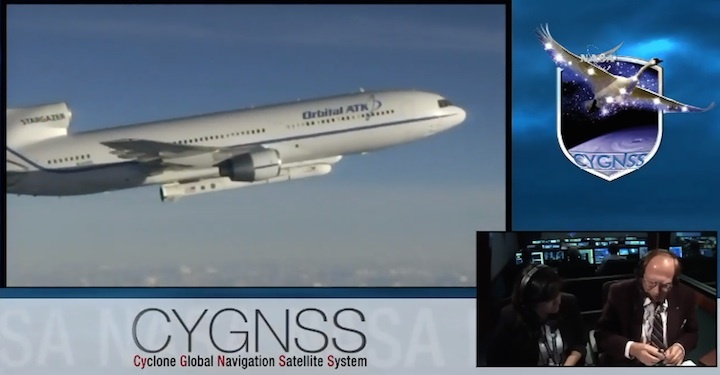 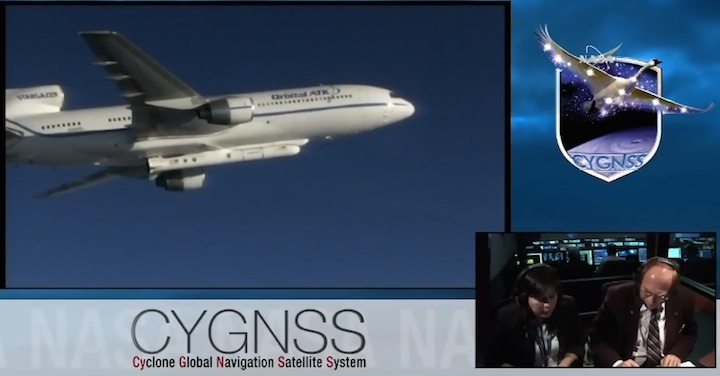 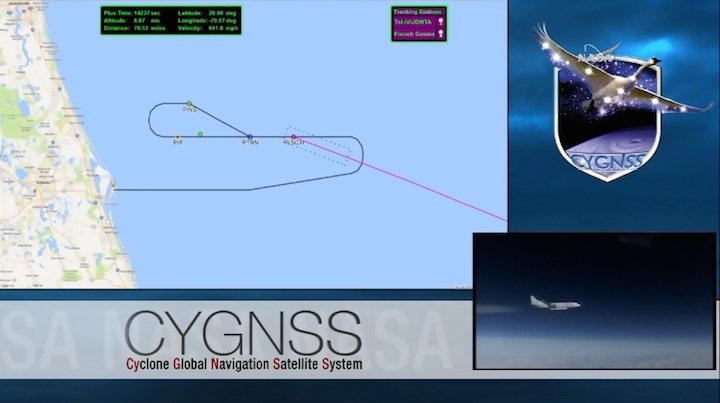 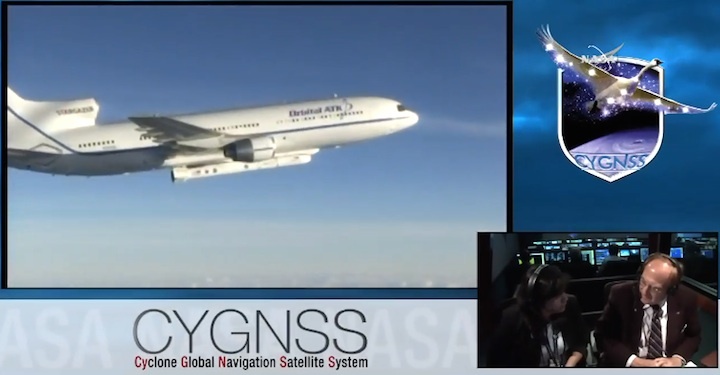 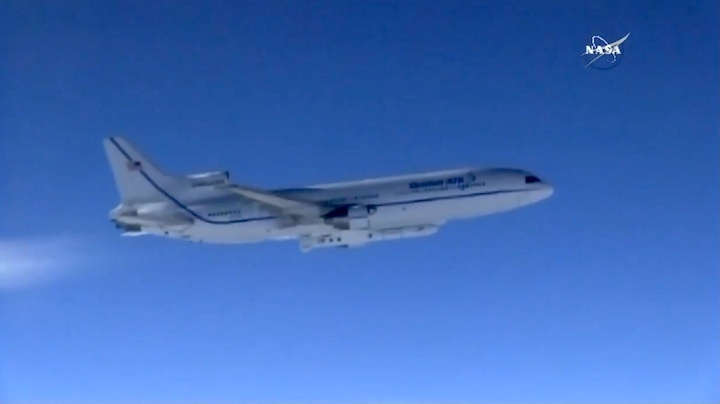 Operating in conjunction with GPS satellites, the CYGNSS constellation will zoom over tropical regions to measure wind speeds over the oceans. 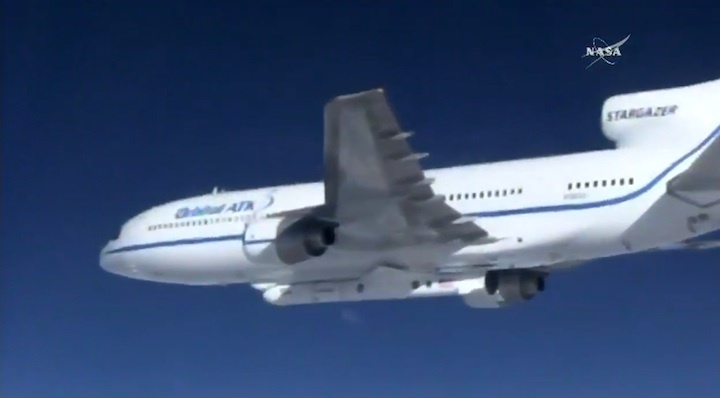 Data gathered from the satellites will be used by NASA to better predict the formation of hurricanes and forecast their impacts. 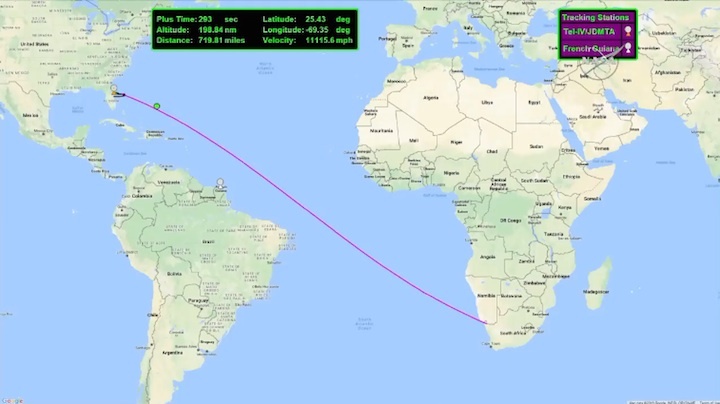 When in their final orbits, the eight satellites will be spaced apart so each orbit over the same location on Earth every 12 minutes. 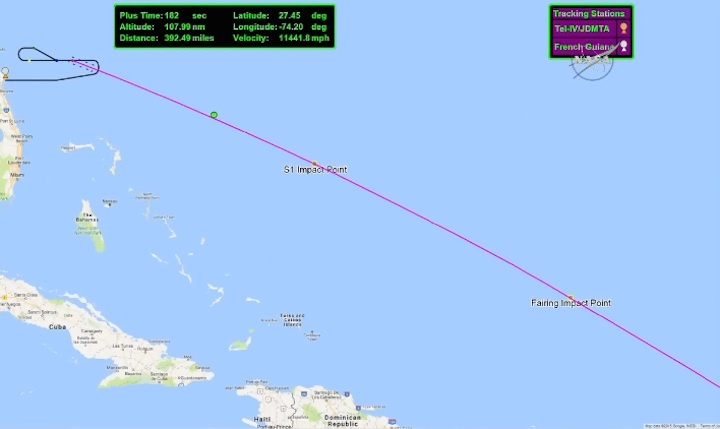 This global, real-time coverage will be a huge boon to the science of what drives some of the most powerful storms that can wreak havoc in tropical regions. 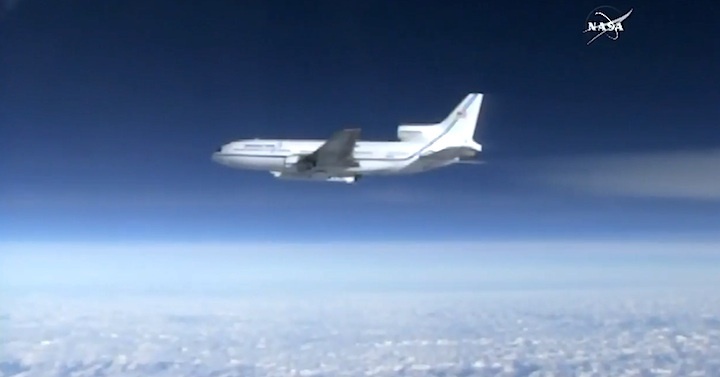 WATCH VIDEO: The Earth's Magnetic Shield Cracked, Are We Doomed?